Winglets: 4 Week Downtime For Falcon 2000 Series Aircraft? Duncan Aviation's 4 week Falcon 2000 winglet downtime is the result of scheduling the most modifications and developing innovative techniques. Additional photos are available in the Falcon winglet press release. 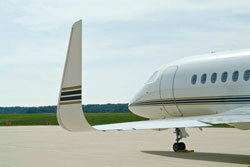 Falcon 2000 series winglet modifications take about four weeks, while Hawker 800 series runs about 21 days. How is Duncan Aviation able to quote a four week downtime for Falcons when the rest of the industry seems to be at six to eight weeks? And why the discrepancy in downtimes between airframes? I talked with Dale Hawkins, an Airframe Service Sales Rep. at Duncan Aviation-Battle Creek, Mich. for explanations. Falcon winglet modifications take longer due to the amount of internal wing work, says Dale. Dropping the planks and adding the reinforcements is time consuming. The Hawker 800 series design allows for most of the reinforcements to be external to the wing, which equates to a shorter turn time. As for Duncan Aviation’s comparably shorter Falcon turn times, projects tend to become more streamlined the more experience a service provider has with them. Like everyone else, Duncan Aviation began with a six to eight week turn time when the Falcon 2000 winglet modifications were first offered in 2008. The first three projects were a learning curve. Nearly 20 modifications later, we’ve pared it down to four weeks (whether or not it includes a Falcon dry bay modification). Both downtimes are relatively short, but they can be scheduled with other projects when an aircraft is down for service. For advice on what projects to schedule with winglet modifications, read next week’s blended winglet blog post.